Biomimicry: Inventions Inspired by Nature by Dora Lee. 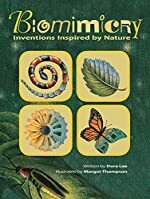 Review: Biomimicry: Inventions Inspired by Natureis written by Dora Lee and illustrated by Margot Thompson. Biomimicry is a non-fiction book about nature's talent affecting human's inventions. It is not part of a series and the only characters are an assortment of animals and plants. Biomimicry is for people who are 8 years and over. Biomimicry compares inventions inspired by plants and animals. For example, a shark's skin has groves that overlap each other so the water can move more easily instead of bumping against the water. Then in the 2000 Summer Olympics Games in Sydney Australia 28 of the 33 gold medal winners wore sharkskin-inspired swimsuits to boost their speed. Also, small like cockleburs inspired the invention of velcro. Even inspired by nature's nanotechnology, scientists will make artificial photosynthesis, for cheap clean power. Biomimicry can teach you about inventions that could happen in the future. Each page is filled with astonishing facts that are not known to many people. I really admired Biomimicry: Inventions Inspired by Nature. I liked all the facts in the book. They were mostly something I didn't know and also some of the facts were worth to know in daily life or even for fun. I really didn't like that Biomimicry would discuss on inventions that did not already exist. I think there should be more inventions that are already here, active and not some going-to-happen stuff. Biomimicry is mainly for basic knowledge and knowing fun facts. Only people who wanted basic knowledge would want to read it. People who like non-fiction and a little science fiction should be interested. It may seem interesting to most while it may not interesting others so it depends on the reader. Review written by Vraj (7th grade student). We would like to thank Houghton Mifflin Harcourt for providing a copy of Biomimicry: Inventions Inspired by Nature for this review. Have you read Biomimicry: Inventions Inspired by Nature? How would you rate it?